Have your ever tried making salsa from scratch? Here’s a simple chunky salsa recipe that’s yummy with tortilla chips and quesadillas. It’s a great way for kids to practice their chopping skills. For a smooth salsa, you can mix it all up in a blender. 1. A grown-up can help dice the tomato. Put it into a medium-size bowl. Cut the garlic clove in half, and crush it with a garlic press into the bowl of tomato. Chop the green pepper and add it to the bowl, too. 2. Mince the chili pepper and add 1 teaspoon to the salsa (if you would like a little spice). 3. Snip the cilantro with kitchen scissors. 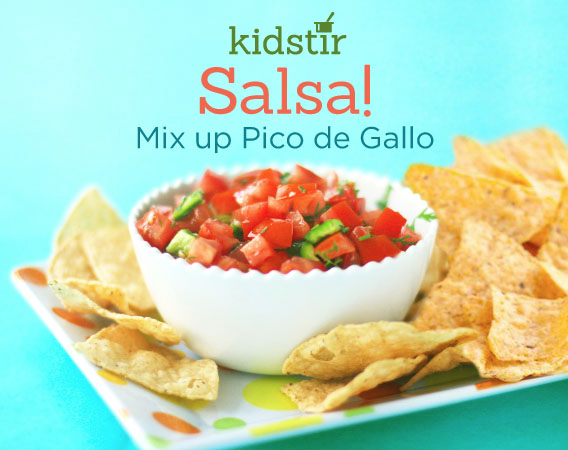 Measure out 1 tablespoon and stir it into the salsa. 4. Squeeze the juice from the lime quarter over the salsa. Add a pinch of salt and stir again. 5. Taste the salsa and add more salt, lime juice, garlic, or pepper, if you’d like. Eat it right away or refrigerate for up to 1 day. Enjoy with tortilla chips!